Hutchison Fiberglass Pools & Spas exclusively installs Viking Pools due to the unlimited design capabilities & sustainable value that comes with owning a Viking Pool. We are the only licensed Viking Pool dealer in Ocean County! Our team has experience with every type of pool and terrain and can advise you on the best pool for your family and budget. We’ll help you choose a pool that suits your family’s needs. We are a professional member of NESPA (The NorthEast Spa & Pool Association) and hold a valid Class A contractor’s license. In fact, we provide everything needed for your new pool or spa installation – including concrete paving, pavers, fencing, and landscaping. When you choose Hutchison Fiberglass Pools & Spas there is no need for other contractors! My wife and I are senior management in service/sales organizations. Our experience has shown us the many situations that one can face when attempting to "get the job done". In the two years we have worked with Hutchison Pools, they have become the ONLY company I will consistently recommend. I don't mean just pool companies, but ALL companies that one may have to contract with to get work done at your home or business. After interviewing several fiberglass pool companies, I selected Joe Hutchinson as the most competent to install my pool. This process began in 2002 and I continue to use the services of Hutchison Pools for weekly maintenance, as well as seasonal opening and closing of the pool. I have recommended his company to other potential customers who have also been very happy with his services. This is our second season with Hutchison Fiberglass Pools and we couldn't be happier with the service that we receive. Joe spent a great deal of time just walking us through everything we needed to do and what he was doing. We are so satisfied and happy with the service we received. Our pool is the talk of the neighborhood. We would recommend Hutchison Fiberglass Pools to anyone and we are excited showing off the pool. We were quite fortunate to have chosen Hutchison to install our pool. Their suggestions, installation and subsequent servicing has been as friendly, helpful and professional as we could ask for. We recommend them very highly. From start to finish our experience with Hutchison Pools was amazing. This is a family owned business and each person in the family that we dealt with had their own role from design to installation to maintenance . Any issue we had all we had to do is call and someone was on the phone or at our house. We love our new pool and jacuzzi! We highly recommend Hutchison Pools for all of your pool needs. From our first planning meeting to updates from their wonderful office staff we knew we were in good hands. Joe has been hands on during this entire process and we will be enjoying our beautiful pool as soon as warm weather arrives. Our side yard is very small but Joe had a great selection with a bench seat all around and just 4 foot deep. Once the fencing and pavers are complete we will have the perfect fit for our family, especially our visiting grandchildren in the summer! For several years I wanted to install a pool in my backyard, but I was concerned about how difficult it may be , how long it would take and would I be happy with the outcome. As soon as I sat down with Joe at Hutchison Pools I knew I found the right company I could trust. The entire process from the planning phase to excavation and installation was done with extreme care and professionalism. My backyard is a Beach Haven oasis and I couldn’t be happier with the results. Ten years ago I was putting in a pool in LBI in my dream house. My pool contractor left town...literally! Trying to find a pool guy in May to clean up someone else’s mess was impossible. It was our first Memorial Day in our new house and a pool party was not in our cards - until I met Joe Hutchison. Hutchison Pools came in and fixed the other contractor's mess and had my pool running before the holiday. I wasn’t even a customer yet and I got superior service! I’ve been a customer ever since and would recommend to anyone. We have been working successfully with Hutchison Pools for over 15 years and we couldn't be more satisfied. Hutchison Pools has a great team of polite, trustworthy, knowledgeable and hard working people. Always reliable weekly pool cleanings to regular maintenance our pool always looks and runs beautifully. They clean and service my pool without fail. It's always a pleasure to work with them. We highly recommend using Hutchison Pools. We had always wanted to put a pool in our summer home and didn't think it was possible due to having Waterfront property. We did our homework and went with Hutchison Pools and Spas and we are glad we did! From ordering pool and the right pool for us, to the install, the finished product couldn't of went smoother! Not to mention great customer service. Thanks Hutchison Pools for giving our family years of swimming fun and memories. I am writing this letter to highly recommend Hutchison Pools. Great company to do business with and we will be starting our 11th year with them for all our pool services. Hutchison Pools has always responded to our service needs thruout the years in a professional and timely manner. They have a professional staff. Looking forward to many years to come. Let me start by saying Hutchison Pools is awesome! I have a pool and hot tub both are beautiful and so much fun. This company has been nothing but the best any question I had was answered very quickly, you can count on them anytime day or night . I would highly recommend Hutchison Pools always the greatest backyard entertainment I could ask for. Keep up the fabulous job of customers first. One very happy customer. We met Laura and Joe back in 2010, when we were thinking about putting a pool at our beach house in Love Ladies, NJ. We had spoken to a few other pool companies before hearing about Hutchisons. In our first meeting with them, we were so impressed with how personable they were, treating us like old friends. The pool was installed by professionals who really knew what they were doing. Nothing changed over the years - if something goes wrong, they send someone as quickly as possible. My husband and I had our pool installed in 2012 and then maintained every year since then by Hutchison Pools. The installation was thorough and Joe was there overseeing every step of the way. They are always available to answer any questions we have. They personally know their customers and really care. We get so much enjoyment from our pool and it is so nice not to have to worry about maintaining it because we know it will be well taken care of by the Hutchison Pool Team. Our Viking Pools carry any number of custom features that can suite a backyard of any style. If you need help choosing a pool for your home, give us a call today. One of our pool technicians can help advise you on the styles that would work for your size property. The only limitation to your pool is your imagination. Our pool installation experts can custom design something for any backyard oasis. A traditional pool shape perfect for any home's backyard. We have over 18 years of experience, Hutchison Fiberglass Pools & Spas stands a step above other Ocean County pool experts. Our goal isn’t just to drop a pool in your yard– our goal is to beautify your backyard and make it into your own personal oasis. With custom lighting, rock formations, and landscape design available for every pool installation, you’ll never need to vacation anywhere else again! Here you can view pictures of our completed work including customized pools, pool designs, waterfalls, and lighting options. 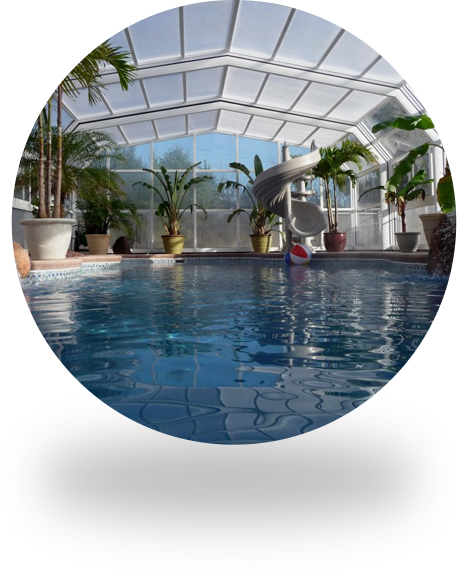 We handle everything from the design of your new pool to the installation of it. See a design you like or have something in mind for your yard?